ResidentDante: The bounciness is back! Jokes about the bouncy female characters aside, Dead or Alive is back! It has been quite a wait since DoA4, which arrived almost at the beginning of the 360's lifetime. I've always liked this series from the first game on PlayStation in '98 (I never played the '96 arcade or '97 Sega Saturn version). I thought it was quicker and more responsive than Tekken back then. 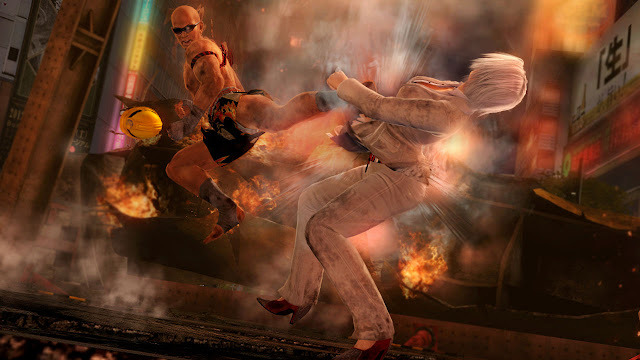 I've played the series on through the years, and found DoA4 being one of my favourite fighters this generation. It's a game that doesn't take much to get into, is fast and agressive, and a game I continued to bring out to play when friends visited to have a few rounds. You can hear Jann-Lee's high pitched scream by just looking at this pic. 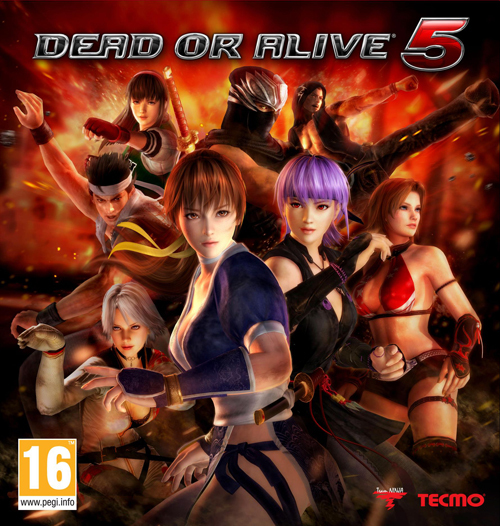 So here Tecmo are back with DoA5, in a genre that is one of slowest to adapt and change much from it's original formula. 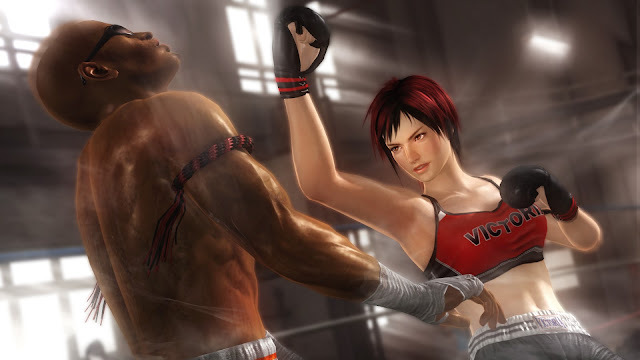 DoA carries a lot of heritage from Sega's famous Virtua Fighter series. DoA very similar, with it's three button layout (kick, hit, and defence), the DoA series, however, added a grab/throw button and a lot more speed than the VF games. 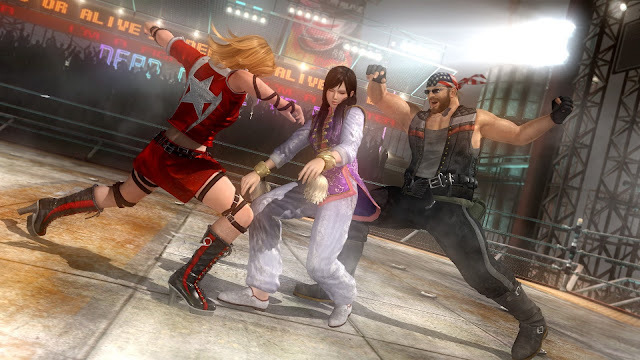 It's fun to see that DoA5, with a few selected VF characters making an appearance, gives gratitude to it's inspiration. Mila and Tina's "ghetto" fight and intro is actually the best in the game. One of the few actual fighting costumes. The first major change in DoA5 you'll notice are the character models, they are really impressive. They have changed from the simple, yet characteristic anime look from the previous games, to a much more realistic and highly detailed look. The character models are something of the best I've seen in fighting games for years. They even get get sweaty and muddy from fighting and falling to the ground. The fighting arenaes are large as usual in a DoA game and add some cool ways to interact with them. 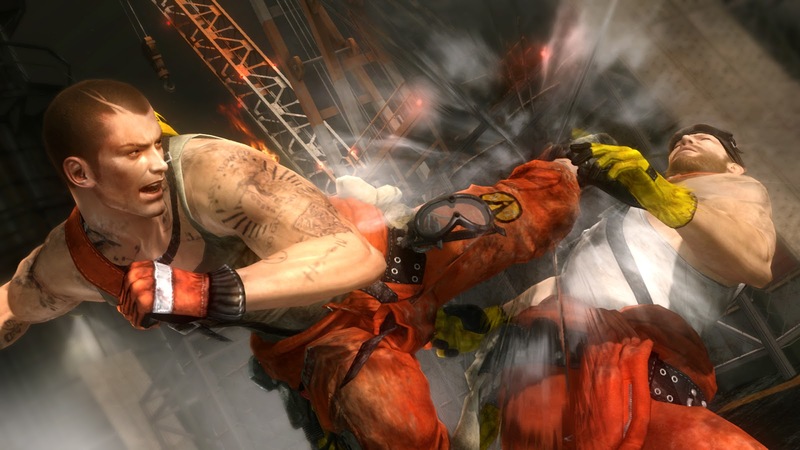 Fighting often continues on a new level after players get pushed or smashed off an edge. The arenaes are, however, are a varied bunch in the graphics department. Some are great with amazing lighting, others are very simple and have some terrible, almost last-gen, textures. 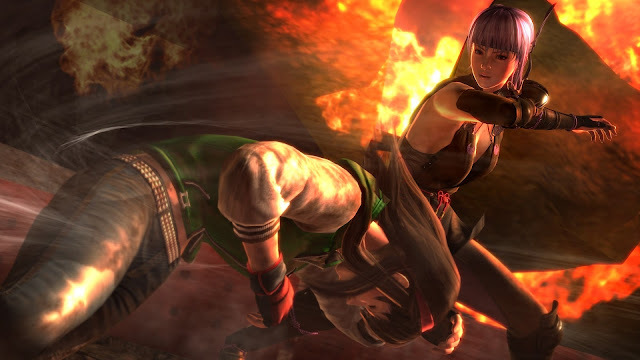 Taking a punch from Ayane! Tag mode lets you do some unfair, but cool tag moves! 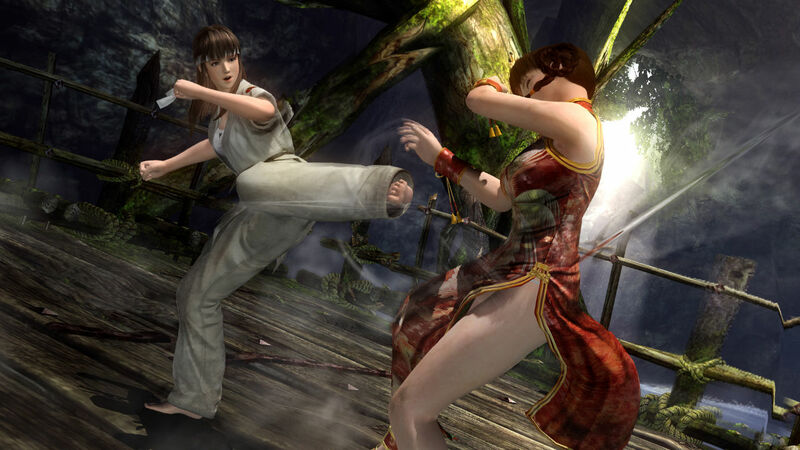 Another big change in DoA5 is the addition of a story mode. I haven't seen something like this in a fighter since the last Mortal Kombat and before that probably the older titles in the Soul Calibur series (though these were driven mainly by onscreen text). The storyline is incredible cheesy and has terrible dialogue. It's so bad it's almost funny, almost, so it ends up being rather embarrassing. Much more so than what it wishes to be. I like the idea though, making you play each of the fighters in turn and learning about their past, but it could have been done so much better. I miss the arcade endings they have sacrificed for this too. They could honestly have just added them, as content isn't something fighting games have a lot of anyway. It begs to ask the question: Will there be a DoA: Xtreme based on this game, and if so, why isn't it just implemented into DoA's story mode? That would have been a fantastic edition and would have room for much more variation. The game really shines when you play it together with friends and I like the fact that they have a tag mode in there as well. The classic one-on-one fighting is the best in DoA5 though. It really is a fighting series I have a strong feeling for through all these years, it never disappoints in how easy it is to get going and how fast it plays. You will have hours of fun playing it with friends and it will certainly be one of the favourite games to bring out when you just want a fix for some multiplayer action. There's a bunch of very different characters to choose and corresponding amount of costumes for them. Combined with the interactive fighting arenaes it never fails to entertain it's players and bring out many laughs. There are a couple of new, cool, characters too and a handful of VF fighters to keep things going. Nothing like a good uppercut! DoA5 probably is the best looking fighter out there now (in super smooth 60 fps) and I would recommend people take a look if they want a fast and easy-to-learn fighter. There is content here that will keep Virtua Fighter fans happy too, although the pacing is a lot quicker and less technical. It's good to see Tecmo trying to push the genre further and taking a technical jump ahead from it's other rivals. If only these Japanese developers weren't so slow to change and add much more content. All in all, a welcome comeback for DoA fans like myself, recommended warmly!